BMW used only three different headliner colors: 1) black (schwartz), 2) beige (pergament), 3) silver grey (silbergrau). Part numbers are dependent upon build year and color (material quality upgraded from 9/92-on ['93 model year]). The headliner fabric in the 8-series tends to fall down as it ages, just as on many old domestic cars. Embarrassing. The obvious fix is headliner replacement or refinishing. But there are hidden traps. 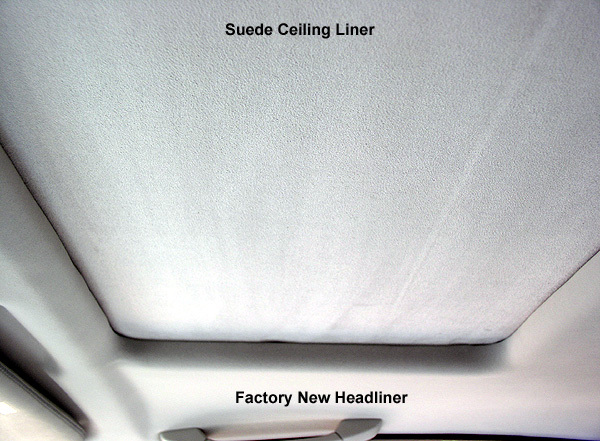 To begin, the complete headliner consists of the headliner (#1, diagram 1), motor cover (#2, diagram 1), ceiling liner (#1, diagram 2), plus the sunroof's underside trim panel (#2, diagram 2). This is especially pertinent for those changing headliner color. Otherwise, of these four parts, the trim panel has such low visibility it can probably be exempted from concern (see #5 below for more). Note both ceiling liner and trim panel replacement costs versus the other two parts. Also note pillar covers share the same factory material as the headliner. Most importantly, original BMW fabric is not available from auto upholstery shops! While many claim to carry "factory" materials, be advised these are really factory-like materials (usually from Mercedes). This means exact fabric texture and color matching will not be possible. The implications are many. You must decide whether to go "aftermarket" (in which case you'll need to refinish all headliner parts including the pillar covers, for a true match) or stay "factory" (which means you'll need to buy factory replacement parts). If staying "factory", new parts may still not be a perfect color match due to age. Years of exposure to the sun and other elements may leave your pillar covers a slightly lighter color than a new headliner, for example. Except for the perfectionist, this shouldn't be cause for concern as the difference is barely noticeable. An economical refinishing option suggested by some (from Tech Talk letters in Roundel magazine) has been to simply peel the old fabric off the headliner and paint it. Yes, really. While it may appeal to some, I think such a solution would not be appropriate for a luxury GT car like the 8-series. Factory new parts use fabric with foam backing ranging in thickness from 1/16" (pillar covers, ceiling liner) to 1/8" (new headliners). The slimmest aftermarket materials will all have a 1/8" foam back. If the ceiling liner is refinished with an aftermarket material, its 1/8" foam back will cause additional resistance in the liner's sliding track. This resistance will reveal any weakness in the (old) moving parts of the sunroof, possibly causing parts failure or jamming until the new materials compress over time (see #3 below for more). On most cars, only the main headliner is falling (#1, diagram 1). This is good news, meaning only this part needs to come out. But this can also mean other parts are not far behind. 1) Color matching not possible - (Except maybe with black.) The implication is you will then need to refinish your switch panel, ceiling liner, and pillar covers to match, perhaps at additional cost. Although most won't notice the difference (or may think it's normal), you will know. This difference is most noticeable at pillar cover/headliner junctions (right in front of your face). See image below. 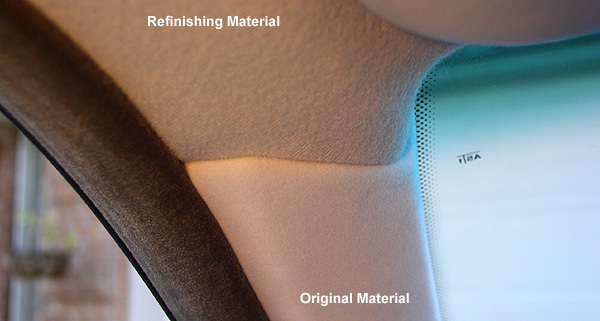 2) Texture matching not possible - No upholstery shop has original BMW fabric, nor can it be ordered. Cars built prior to 9/92 may use materials easier to approximate. However, from 9/92 there was a switch to upgraded materials. Much to BMW's credit, this material is of superb quality with the feel of velvet. Most refinishing materials will look noticeably cheaper by comparison. See image above. You may notice slower operation and dragging in the sunroof as the clearances in the sliding track have been reduced. This will be the case until the 1/8" materials used on the ceiling liner compress over time (4-6 months). In the meantime however, this may lead to sunroof malfunctions (usually skipping of toothed racks thru worn-out cable trolley guides, resulting in uneven tracking/jamming). This may lead to a sunroof rebuild. Refinished parts will have a "plump" look. 4) Fingertip imprints - My experience has shown newly refinished materials are prone to visible imprints from fingertip pressure used when handling. It's impossible to avoid using your fingers when installing these parts, so some "damage" is inevitable. However, the imprints tend to fade with time (2-3 months). A steamer may remove the more noticeable imprints, however this isn't always effective. 5) Trim panel - Often forgotten, it's of the same material as the original headliner and therefore will not match the new materials either. It's purpose is to hold down the ceiling liner and cover the unsightly underside of the sunroof panel when tilted. Since only a small portion of this panel is ever visible (only when sunroof is tilted), any mismatch will probably go unnoticed. Like the ceiling liner, it is outrageously expensive to replace. 6) You're committed - Unless you save the old fabric, you cannot easily "go back" after refinishing due to the replacement cost of the ceiling liner. Remember, original fabric cannot be purchased separately (although many claim to have it). 7) Sunroof removal required - to access the ceiling liner. See Sunroof Rebuild for instructions. Highly recommended for authenticity and quality - and especially purists. The result will be an effective color and texture match, blending seamlessly with your pillar covers. Always save your old material. If your sliding ceiling liner later needs replacement, take the washed and cleaned material to an upholstery shop for re-skinning. Otherwise, you'll be stuck with outrageous replacement costs. If transporting the headliner, remember it's an oversized part requiring either a truck or large SUV/Minivan. Some out-of-town dealers will not ship this part (shipping: $150+) and it therefore may need to be purchased locally. When removing and installing just the headliner, sunroof removal is not required. UPDATE (March, 2010): Apparently, factory replacement headliners are no longer available in black. This leaves refinishing as your only option. As stock levels deplete over time, this problem may occur with grey and beige. Also, some sunroof motor covers are no longer available either, such as grey. Headliner Replacement 1 - by "BoeingChick" from the Roadfly forums, July 21, 2006, very concise, 1 page. Headliner Replacement 2 - from E31FAQ's, by Marty Saracino, April 28, 2003, with photos, 14 pages. Headliner Replacement 3 - from E31FAQ's, no authorship credit, lengthy with photos, 25 pages.